I love the writing duo of Sarina Bowen and Elle Kennedy! Stay was one of my most anticipated reads and it didn't disappoint! We met Matt Eriksson in book 1 of the WAGs series, Good Boy, and now we get his backstory and the details of how (and why) his marriage fell apart. 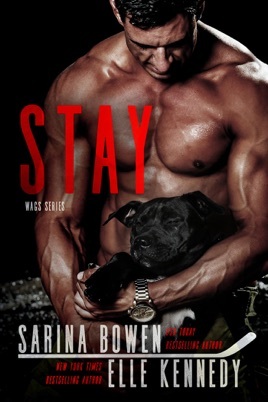 Stay is book 2 in the WAGs series and can be read as a stand alone, but characters from previous books do appear in this interconnected series. I truly enjoyed this low drama romantic comedy. The authors have an amazing sense of humor and I love all the witty banter and innuendo between the characters. This is a series where I love the hero and heroine, just as much as the supporting characters. The families, bromance, and sisterhood are all incredible and I love how supportive and caring all the characters are (especially the WAGs). Stay was exactly what I needed and wanted - a sweet, funny, and low angst romance. The chapter titles are the best and I loved catching up with the characters we already know and love like Wesmie, Blake, Jess, and of course, Mama Riley. I can't wait for more books in this series and I'm hoping the team's resident manwhore, OC, gets his story next! Swoon, swoon, and more swooning! Holy character development. This book was such a cute and inspiring read it made every part of me melt. First we have Hailey, an almost 30 year old, somewhat newly divorcée who lost all of her edge and spark after the divorce, becoming engrossed in work and never thinking about relationships. Then we have Matt, another newly divorcée who thinks he's unloveable and awful when it comes to relationships because he ex wife decided to tell him that constantly. When the two find each other, it's a strictly business relationship but when feelings get involved, they slowly begin to unravel for each other and learn so many new things about each other. I loved seeing how they both went from closed off, not truly happy people, to vibrant, confident people all with the help of each other. And of course getting glimpses of the characters from the HIM/US series, as well as Good Boy was the icing on the cake. This addition to the WAGs series is an enjoyable read. Some favorite characters from previous books are back which is fun. The premise of the book is an interesting one...who wouldn't love to have a FETCH of their own?! Matt is heartbreaking in his guilt and lack of self-esteem vis-a-vis relationships. Hailey is a little too neurotic for my taste and at a couple points in the book I really needed it dialed back. I seriously wanted to throat punch Kara and it grated that Matt was way too spineless in dealing with her...just didn't work for a hockey player. The element with the former father-in-law had more potential but it flashed and burned too quickly. Overall a very enjoyable read that inspires the emotions I always get from these authors. Will look forward to the next in the series. 4.5 stars.